Question: Is it possible to enter AP Transactions that link to AR? AP and AR cannot be linked in the same transaction. Solution: An Accounts Payable Vendors type account can be created in Maintain<Chart of Accounts. 2) Choose Segment Type of GL and assign the account a code number. Hit Tab button and the Chart of Account Wizard will launch. How to Add or Move Content on a Check Without Forms Designer. I do not own forms designer but want to put custom elements on my check or move the alignment of my check. Is this possible? Why am I getting a Payroll transfer error saying a new, valid code is invalid? The summary asset ledger displays the incorrect Begin Depreciation value for assets that have been disposed. It appears to show the current depreciation as a negative value. When someone is posting a transaction that is pretty big (about 10000 lines) the users, that are not currently in MIP and trying to log in, will get splash screen until that entry is posted. 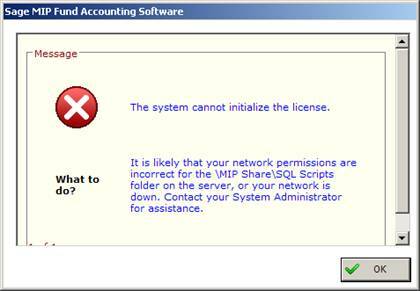 When logging into Abila MIP Fund Accounting the following message displays ‘Login Timeout Expired’. Question: I have lost the password for User ID ADMIN. We have successfully upgraded, but can't unlock users or change rights assignments. Is there a default password set when the software is upgraded? If not, how can I get the Admin password reset?